Kate’s Kart has touched thousands of people through our free books. It’s amazing the peace, distraction and smiles a simple book can bring to a child in need. We invite you to share your story with us! How did the gifting of a book impact your hospital stay? What about even years later? Do your “Kate’s Kart books hold a special spot in your home? About a week before Christmas, our daughter began to have wheezing spells at night. Our pediatrician had us bring her in. My husband went alone and I went to work. We both just thought it was related to a cold, so we felt only one parent needed to be present. My husband called me about an hour after the appointment and said our daughter was being admitted to the children’s hospital at Parkview North for a possible RSV diagnosis and to monitor her oxygen levels in case they dropped. No parent wants to hear that news over the phone…or in person. She was only 4 months old too. The staff were great and helped walk us through everything. No RSV thankfully. Just some bronchialitis. We were there a couple days. At one point, I had to go to work for a couple hours. While at work, my husband texted me and stated our daughter just recieved a free book and she was loving it! He said they had read through it a couple times already and now was doing tummy time while staring at some of the pages! It lifted both our spirits to see our girl smiling again and being herself as well. She also didn’t cry the next time the nurses walked in, so that was an added bonus! Thank you so much for providing us with a little relief and distraction during a very worrisome time for us new parents! We still talk about it and share this story with friends and family! Our Kroger card is linked to your organization and we have attended every event and donated books throughout the past year! We couldn’t be more thankful for what you do! Johnny was born on July 6, 2017 at Dupont Hospital in Fort Wayne, IN. 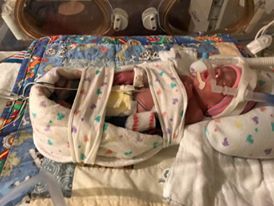 He was born at 31 weeks and was 2lbs 9oz. When he came into the world, his Dad and I were scared beyond words. I didn’t get to see him for 24 hours and I remember the first time going in to see him, I asked his Dad where the book “Muddy Paws” came from…he said he wasn’t sure…The next day, another book arrived…and by this time, we were both curious, so we asked his nurse. She told us the story behind Kate’s Kart and we couldn’t believe the generosity behind it. 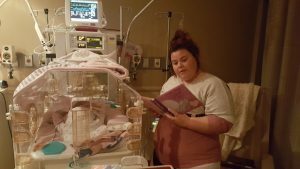 We had a 52 day NICU stay and accumulated 30 books. We can’t thank Kate’s Kart enough for providing us with a new book to read to Johnny just about every other day or so. Johnny enjoys being read to and I’ll make sure to share the story with him when he’s older. Our first daughter was in the NICU for 2 nights. My wife and I were both a wreck during this time. As she got better we were given a great children’s book by Kate’s Kart. I remember reading this to her and seeing how intently she was listening and looking at my wife and I. This was the first time I knew everything would be alright. This was a wonderful gift. Thanks for this moment that will always stay with me. 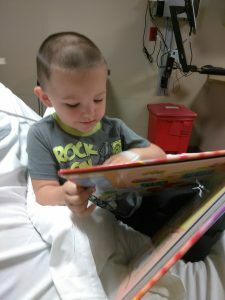 My 3 year old son had to come to the ER, which was pretty scary for him and for me. Soon the nurse came in and asked him if he’d like to pick out a book which he was so excited about. Reading it to him really helped calm both our nerves. Thank you so much for what you do. One of the first times my daughter had to go to the hospital and stay for several days, Kate’s Kart came around and offered my daughter a book. Considering we didn’t have a chance to grab anything from our house, we didn’t have anything to entertain our daughter as tests were being ran and strangers walked in and out constantly. There was a book I read to my daughter, Hope, at our house everyday. To our great surprise, Kate’s Kart had that exact book! Hope was super excited and made the transition from ER to actual hospital stay that much less stressful. I actually asked the woman what was Kate’s Kart about and when she told me the story behind that, I almost cried. It is very much the little things that make a difference. This is one of those things. Our son Braylon was born 9 weeks early and in the NICU for a month. Kate’s Kart came around twice a week and left books. We read them to him often and it kept our spirits up on our long journey! We were then back at Parkview Regional in Fort Wayne at 2 months old for pneumonia and aspirating into the lungs. We can’t thank Kate’s Kart enough for the books which we will continue to read to our son for a very long time! 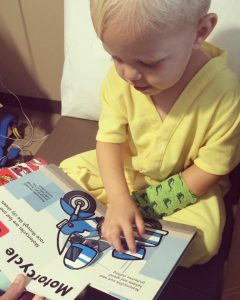 We received the perfect book for a 2 year old motorcycle enthusiast recovering from a tonsillectomy overnight! Thank you, Kate’s Kart!! Preston and his twin sister, Paige, were born at 35 weeks on December 30, 2011. Preston was whisked away to the NICU for 10 days due to breathing problems. His sister was healthy. I will never forget the day I found his first book beneath his isolette. I asked the NICU nurse where the book came from and she told me that a volunteer with Kate’s Kart had dropped it off. I’m still not sure if it was a volunteer or nurse who read our first Kate’s Kart book to my precious boy, but I do remember her telling me that the book was read to him. That feeling right there… Somebody gave my baby their undivided attention that day and spoke directly to him! What a feeling of comfort. So for that, thank you from the bottom of my heart Kate’s Kart and to whomever read to Preston! We still enjoy our Kate’s Kart books and they will forever bring back such a comforting feeling. Kate’s Kart has been such a great thing for us to start a tradition to read to our little Girl every night before we go home… Thank You! Our daughter Courtney received her first Kates Kart book two months before she turned 4 while admitted to KCH for pneumonia. It was a Winnie the Pooh book that brought tons of smiles to our daughter. At the age of 5.5 Courtney was diagnosed with enteritis related juvenile arthritis which required IV infusions at Lutheran hospital every 2 weeks to control it. Kates kart became an even bigger part of our lives then her face would light up when they’d come to our room and offer her a book, it gave her something to take her mind off of the infusions. 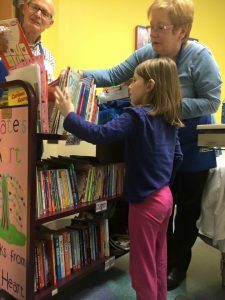 The volunteers are so patient as she takes forever to carefully pick out just the perfect book, they offer suggestions and discuss what she might like. They always put a smile on her face no matter what. Courtney is 8 now and she still receives infusions at Lutheran and is still like a kid in a candy store when she sees Kates kart on the floor. The first book she learned to read by herself was Dr. Seuss, One Fish, Two Fish which she received from your cart. Courtney collects books on her birthday for the cart. Kates Kart has meant a lot to our family it has made getting infusions not a struggle because she has something to look forward to when she arrives even if we arrive after they’ve been on the floor there’s always a special book waiting with her name on it. This past summer she was asked to speak to some of our state senators about juvenile arthritis, one of them asked her if she ever felt sad about missing school for her infusions, her response was ” no my infusions are fun because I get a new book from Kates Kart” You’ve made a great impact on our family and we will forever be grateful to you! Our son was in the NICU for roughly 4 weeks at IU Health Ball Memorial Hospital. Our stay was an emotional roller coaster. Throughout this time, we met many great people and participated heavily in Kate’s Kart. After grabbing a book, we would read it to our son. During this time, our minds would drift away from the anxiety that parents feel while in the NICU. For the duration of the book, we were just parents reading to our son! Believe me, anything that provides families in duress with a sense of normalcy is a noble cause in my opinion. It also helped our older children cope with the separation they felt from their brother! We would tell them the books were a gift from their brother. They loved it!!! One year ago today…tucking my little valentine in after his bath and reading his first Kate’s Kart book (Curious George). Just received a book from Kate’s Kart, the best part of having a sick kid in the hospital. Thank you!!! Hello, my name is Jessica Gray. In December 2013, my daughter was admitted into Ball Memorial Hospital with RSV. She was there for roughly 3 days. During her stay, a woman came in with an Eric Carle book, “My First Shape Book.” She also had brought a blanket with frogs on it. My daughter, to this day, sleeps with that blanket and the book she received continues to be her favorite. Kate’s Kart is a blessing beyond belief. They brought hope and light into a time in our lives where I almost felt there was none. Kate’s Kart has shown me that complete strangers can bring a part of you out, you didn’t know you had. They are truly an amazing organization, and I hope to one day be able to pay it forward in their honor. My son was born 7 weeks premature on 1/9/14. He spent 21 days in the NICU of IU Health Ball Memorial Hospital, the first 8 of which were inside of an incubator. During that time, we were not able to hold our son. Thanks to Kate’s Kart, we were able to read and bond with our son, even if we couldn’t hold him initially. 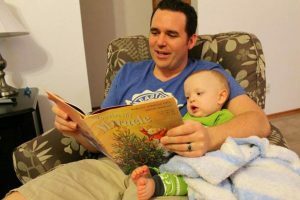 It became our routine to read him a story before we left the hospital each night. We really appreciate the organization Kate’s Kart for making our 3 week ordeal more comforting. Thank you guys so much for what you do! 2 of my 3 kiddos were NICU babes and that little kart made our days a little brighter. We proudly STILL have our books and are proud to say they were the first books my boys ever had. Hi, my son is currently in the NICU. His name is Grayson. I just wanted to let you guys know that what you guys do is awesome and it’s very appreciated! I just wanted to thank you for having such a great heart to do these things for our children! Thanks Kate’s Kart!!! Kate’s Kart! My grand twins were in the NICU at Lutheran Hospital from November 18th to December 9th. You made their stay there extra special. We will use the books that you gave to them for as long as they last! Thank you so much for your generosity! While Julia was in the NICU for the past 45 days, she received a book from Kate’s Kart a few times a week. We started reading these books to her when she was just a few days old. As she grew, we read to her when she was awake, and she seemed to really enjoy listening. 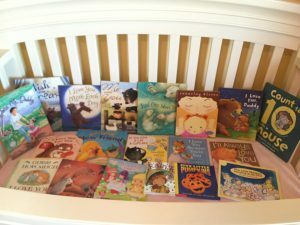 These books helped us create some special memories during our NICU journey and will be a constant reminder of our little miracle, Julia Grace! For the past 4 weeks we have had to spend a great deal of time at Parkview Regional Medical Center because of my father. Not the way I wanted my 9 year old to have to spend his spring break. 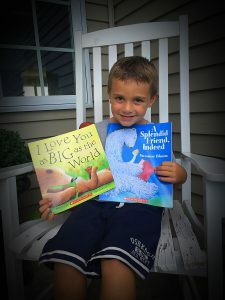 My son was as patient as he could for a 9 year old on the Autism Spectrum, but when Kate’s Kate came around and they asked him if he would like to pick a book, it all changed. He picked out a Diary of a Wimpy kid book and curled up on his seat, and did not move until he started getting hungry. Thank you so much is not even enough for me to express my gratitude. My daughter, Haley, was recently in the hospital for several days receiving treatment. While in the hospital, she spent time trying to pass the day away. On the day Kate’s Kart came, her eyes lit up!!! Books!!! Her passion is reading and your organization brought the light back in her eyes! Thank you so much from a very grateful mother. You and your ministry bless us again and again. Thank you. Thank you! Josh is in liver failure. The disease is destroying his lungs. What you do to honor Kate’s life is an act of kindness that encourages us, blesses him, and helps us cheer each other on one precious day at a time. Can’t thank you enough. “It was wonderful meeting you [Krista] and Kate’s grandmother last week at Parkview North! Jackson was born on Thanksgiving day followed by his twin sister Avery at only 27 weeks and 2 days. Avery passed the following day but Jackson continues to improve daily. Hopefully this month or next we will be able to take Jackson home with us, which is all the way to Oklahoma City (we were up visiting family when the twins decided to surprise us by coming early). Thank you so much for all the wonderful books! Jackson loves being read to and will have something to enjoy for years to come! 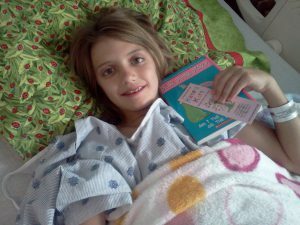 Kate's Kart love’s to hear from those whose lives have been touched by our free book service to hospitalized children. If you’d like to share your story, we’d love to hear it! Fill out the form below and Kate’s Kart it could be featured on our website in the near future. Thank you for taking the time to share your testimonial and how our services positively affected you or your family’s lives. By clicking Submit you agree to allow Kate’s Kart to post your testimonials and photo to our website or other marketing materials.